Apple Yang, Artistic Director of Appetite Dance Productions merges techniques from traditional Chinese dance, martial arts and contemporary dance to define a vocabulary, symbolic of the turbulent global meeting between East and West. In this piece she explores her relationship with her father and what it means to be a Chinese woman shackled by the weight of expectation. 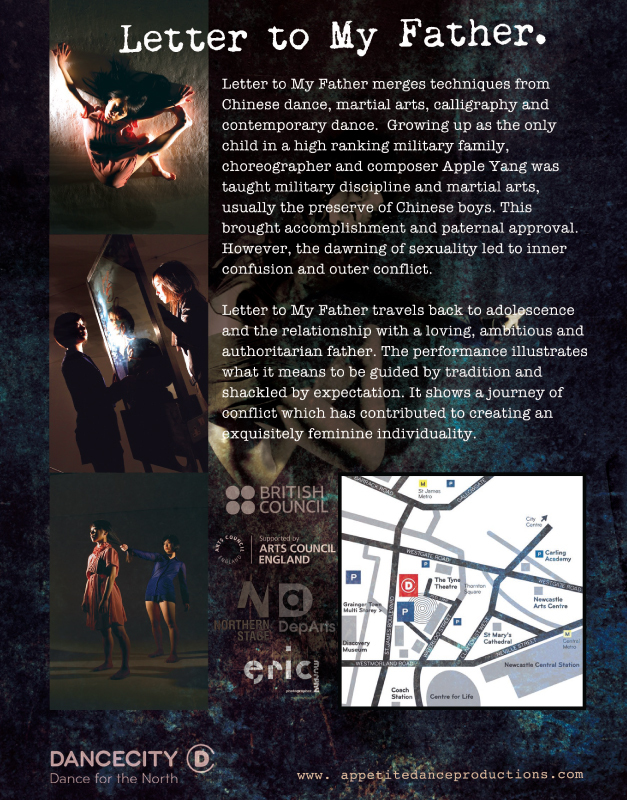 Letter to My Father is a beginning – the first steps in choreographer Apple Yang’s journey back to her adolescence, and are-examination of her relationship with an ambitious, authoritarian but loving father. Growing up as the only child in a high ranking military family, Apple was taught military discipline and martial arts, usually the preserve of chinese boys. Accomplishment brought paternal approval but the dawning of sexuality led to inner confusion and outer conflict. Overwhelmed by constraints Apple Yang emigrated to the UK as a teenager to encounter a life on the edge between Asian and Western culture. In Letter to My Father she explores the recovery and development of her own feminine individuality. 父 、 超 乎 众 人 之 上 、 貫 乎 众 人 之 中 、 也 住 在 众 人 之 內.